The Turner Family Center for Social Ventures sponsored several students to travel to Phoenix, Arizona to attend this year’s Net Impact Conference. The conference, held that the Phoenix Convention Center, featured a series of panelists with myriad experiences in the social impact sphere. 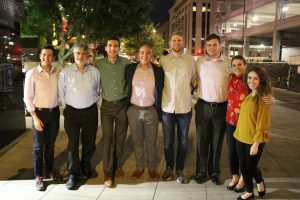 Nasser Mallouky (MBA ’20), Ben Burkeen (MBA ’20), Kate Bennett (MBA ’20), Chris Tambasco (MBA ’20), Joseph Fischer (MSF ’19), Josiah Holland (M.Ed. Leadership and Organizational Performance ’19) each had the opportunity to represent Vanderbilt University at this 3-day conference, where they connected with numerous other students and professionals in the social impact space. The key theme of the conference was best described by Ben Burkeen: “Start with what you have, where you are.” Keynote speakers, including Gina McCarthy (Director of C-Change), Kavita Shukla (The FreshGlow Co.), Anthony Bugg Levine (Nonprofit Finance Fund), and the unforgettable Stephen Ritz (Green Bronx Machine), all focused on the fact that individuals need not wait until they have a position in a company to make a lasting impact, but can strive to improve their communities wherever they are (both physically and in life). 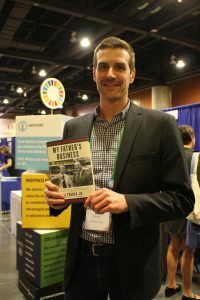 MBA Student Chris Tambasco also commented, “The keynote speakers were without question the best part of the conference. Specifically, Gina McCarthy, Jean Case, and Paul Dillinger. Gina was particularly motivating, Jean spoke about a brilliant history and involvement with National Geographic, and Paul was very well informed about the harmful contributions of the fashion industry and the specifics about making it better.” Learning from key figures who are dedicated to making a positive impact also illustrated the many ways to become involved in this space. No one speaker or panelist had a set background, but each was demonstrably dedicated to his or her cause. In addition to listening to panels, students also had the chance to attend the Net Impact Expo, where organizations such a B Lab, Aveda, Bayer Patagonia, Irex, Kiva, and International Paper answered showcased their involvement in social impact. While there, they met up with Owen alumnus and founding board member of the TFC, Matt Inbusch, who now works for international Paper in Memphis, Tennessee. The Turner Family Center for Social Ventures also hosted a table for Vanderbilt at the expo, sharing their experiences with programming such as treks, Project Pyramid, and more! Likely the biggest take-away from the conference was a sense of hope for the future. Having met several others also deeply interested in working in the social impact space, each of the students returned with a refreshed desire to dig deeper into the topics mentioned at the conference. As Kate Bennett stated: “There are a lot of people out there who care to make the world a better place. 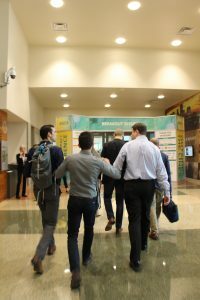 I felt hopeful for our future and it was refreshing to see what is being done in sustainability and social impact, which is something you don’t typically hear about on the news.” Certainly, through the connections made, bridges built, and ideas sparked, no one left the Net Impact Conference 2018 uninspired.